I am sure that residents of Lynch Hill Park would be aghast at signage directing traffic along the road, and I'd have some sympathy. I suppose it comes down to where your personal priorities are. I would like a nice pleasant safe town centre where I can shop, walk and relax, and for public transport not to be held up and made unreliable. Use of LHP may be one way of relieving that. There may be others. I know of commuters from Freefolk who use LHP to reach the station. Are they wrong to? What is best - they use LHP or they go through the town centre? What would you do on that journey? McFauld Way and Alliston Way are different in that they are not through natural routes in the way LHP could be. But they suffer tremendously by the the bottleneck that occurs at Micheldever Road/Winchester Road. On-road parking and the school run are main causes, as well as the increase in development up Micheldever Road. It was because of the high traffic volumes and on-road parking that the Knowlings area lost its bus services a few years ago. Delivery vehicles to the schools often get severely delayed as do coaches to take youngsters on trips. I'd hate to think what would happen if there was an accident/fire at the either school in the morning or evening 'rushes'. Most roads can be safe through routes so long as the users respect the local conditions, and use them in a sensible safe manner. That applies to any road, be it LHP or any other. It is mainly the drivers do not proceed safely and put others at risk who cause the problems. Oh - and that there are too many making unnecessary journeys. 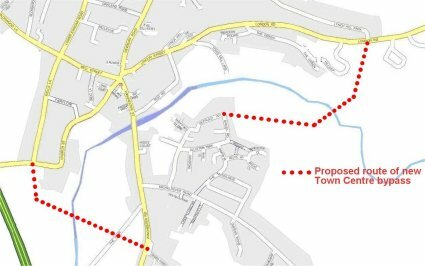 Proposed new route to allow creation of pedestrian precinct in centre of town. A flyover over the Test Valley would allow north-south, traffic to flow along both LHP and then the new bypass. There is plenty of space to the North and west of McFauld/Alliston to widen the road. A roundabout at the junction of Micheldever and Winchester Road (using some of the store car park) plus abit of road widening should solve the Micheldever Rd problems. John, Phil has blown your cover. Lynch Hill Park residents have the same concerns as the rest of us, speeding and heavy vehicles. I support their wish to deter both from their road but the rules are against them. John Wall reckons that SatNav encourages drivers to go that way. LHP is a residential road and I could not support signing it as a through road. I knowingly bought a house on Newbury Street and have never complained about Town centre traffic (nor pedestrian noise). I become incensed when works on the by-pass cause all the A34 traffic to come through Whitchurch. I want Whitchurch as a whole to be an undesirable route for through traffic. It follows that it should not be easy for me to drive to McFauld Way nor to Charlcot. I'm quite suprised that London St is not 20mph or at least an example of why 30mph is too fast. The pavement opposite the chippy and the Red house is narrow, a buses side mirror could easily hit a pedestrian. Its bad enough on bin day or when Mr postie has his bike parked...you have to walk on the road. At least if it was 20mph less people would me inclined to do 30 or 40mph, especially if there were regular speed camera patrols. As for the extending of the 30mph on Newbury St, that was pointless. Even the police and little old ladies either tailgate me or overtake! People just forget its a 30mph and ignore the sign anyway. What we need is more roundabouts. If you read the Highway Code, the speed limit is the maximum you should travel at. I believe that the status of the B3400 prevents it having a lower limit than 30mph, even in Overton where they have put constrictions on it the limit is still 30. As Kot said the existence of the limit is fairly pointless unless it is policed. I was toying with idea of getting a speed gun and testing limits with and without the operator wearing a dayglo yellow jacket. To use Kot's continental experience, for many yars the German police put carboard cut outs of policemen at dodgy places and strangely people slow down!! I was toying with idea of getting a speed gun and testing limits with and without the operator wearing a dayglo yellow jacket. There is a problem with that. The minute you put on a dayglo yellow jacket you become 'invisible' to all traffic. It is like something out of rent-a-ghost. You stop being human the minute you put one on and become fair game! My mother speaks of how bad the traffic was before the bypass. How a lorry killed a mother and child as it crashed through a window coming down Newbury Hill. I am surprised nobody has been killed on the zebra crossing just before the roundabout. It scares me to death to watch some of it. Fortunately, the hideous parking is a double edged sword as it seems to stop some speeding, whilst encouraging that 'nip through quick' acceleration common to the pinch points in and around Hatch Warren in Basingstoke. It's a tough call how Whitchurch calms things, but it needs doing.